The concept of deep time resulted directly from observations of nature and forms a cornerstone of the scientific description of nature. Field observations led early naturalists to such fruitful ideas as original horizontality, superposition, and spatial scales of events. These ideas in turn led to the notions of sequences, criteria for synchroneity, correlation, and to the recognition of systematic, temporal changes in life assemblages with their many implications for the evolution of life. Early naturalists realized that the earth has a multi-million year history; their inferences were vindicated eventually by the results of radiometric age determination. Being observation based, deep time is readily taught to students using local features, and its validity follows simply from the premise that natural phenomena contain real information. Appreciation of deep time helps us to define the limits to human consumption of Earth resources, as well as to provide a framework for debates among those who hold different views on the domains of validity for science and religion and on the meaning of scientific inferences. By focusing much of an introductory geology course on real features within a specific region, instructors can introduce concepts while gradually building the region's geologic framework. Then, approximately halfway through the course, and before discussion of radiometric dating methods, a summary lecture pulls together the course material to demonstrate deep time. This lecture walks through the region's geologic events, unconformities and stratigraphic thicknesses in the context of geologic rates to make the connection to deep time explicit. The lecture finishes with discussion of the radiometric age of the earth and why a sense of geologic time is important. This approach unifies course material within the context of the regional geology. In turn, the regional geology provides tangible and convincing evidence for deep time. The lecture format for teaching the geologic time scale in introductory geology courses can result in memorization and regurgitation of nomenclature and dates. The professor may attempt to provide a historical context through lecture and laboratory exercises, but the relatively large number of students often prohibits going into the field. In order to provide a field-based context for understanding the geologic time scale, students can do an inquiry-based field project that includes a service-learning component. Over the course of the semester, each student collects an igneous, sedimentary, and metamorphic rock from outcrop exposures in the region. They construct a report from their samples that includes: (1) a complete description; (2) an analysis of the processes by which each sample forms; and (3) a geologic history that explains how each sample fits into the regional geology. The geologic history provides the context and incentive for learning the nomenclature and dates of the geologic time scale. A review of course evaluations suggests that students learn the nomenclature and dates of the geologic time scale better by using this approach than through lecture and lab. Anecdotal statements from the evaluations show that the students gain confidence from the project because they apply concepts learned in lecture. Students also comment that the service-learning component provides a sense of ownership in the project. Helping college students understand how we determine the numerical ages of rocks, the fossils they contain, the Earth, and the solar system can be difficult, but such questions are central to the science of geology and certainly deserve the effort. Regrettably, the overwhelming majority (about 90%) of modern introductory geoscience textbooks and laboratory manuals neglect the subject completely without mathematics of any kind. This has been the case, as far as I have been able to determine, throughout the 20th century, or, to put it differently, ever since radioactivity was first discovered and radiometric or isotopic methods of age determination were first developed. What I found through a short survey of introductory college-level books was that only a small fraction (about 5%) of books include a graph showing the exponential increase of daughter/parent ratio with age, and that relatively few (only about 20%) present the fundamental equation for dating. Both of these surprising facts strongly suggest that, in a misguided effort to pander to the mathematical and numerical illiteracy of contemporary students, a central finding of geology has been and is being superficially treated in the great majority of modern introductory geoscience books. Correcting this glaring inadequacy ought to be one of the fundamental objectives of any effort to improve our teaching of the fundamental facts, concepts, and methods of modern geology. In order to help new students to assimilate the concept of geologic time, I have designed a circular device to compare any span of time to an interval of 24 hours. The device I call chronoescalimeter, has in the outer circle the scale of time one chooses to consider, and in the inner part about a third of the diameter, another circle is drawn subdivided in 24 intervals (i.e. the length of a day). Both scales are arranged in a counterclockwise manner to emphasize the way in which earth scientists measure time, i.e. towards the past. The age of the earth (4,500 Ma), when compared with a 24 hour scale, allows the users to evaluate the duration of major aeons or the evolution of life. The evolution of continental and oceanic crust is, in this framework easily understood and assimilated. The Pleistocene, the rise of mankind, or the way man has modified the environment of the planet in the last 200 years might serve as a basis for comparison of long and short events in earth history. The device is particularly useful to evaluate time intervals in the history of a map area, including those related to unconformities. The creationist Bible-based onslaught against science in general and eveolution in particular has been reasonably effective in present-day America. Propaganda methods include partial truths and gross misstatements of fact. For scientific teaching and lecturing, many of these distrotions can be exposed using a chart of creationists' Noah's flood-based, force-fitted version of geologic time, rates, and events. In addition, the creationist dichotomy of choice between their version of faith and their distorted cartoon of science can be countered by a diagram showing the large spectrum of possible religious beliefs about evolution. To increase public awareness about the relationship of geology to economic and social issues, we need to teach students how to communicate with a nonscientific audience. Also, we need to introduce students to the practice of geology. John McPhee's four books-Basin and Range, In Suspect Terrain, Rising from the Plains, and Assembling California (now compiled as Annals of the Former World) -all present scientific endeavor through the eyes of a practicing geologist. One of the compelling reasons for using McPhee's books is that he is writing from the point of view of a learner. 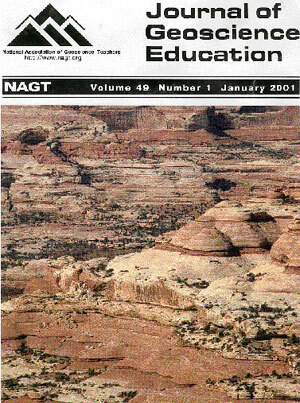 We selected readings and developed guidelines for students to think about McPhee's geologic points and his writing techniques. One of our selections is fromIn Suspect Terrain and shows McPhee touring the Delaware Water Gap outcrops. Based on written responses, all the students in a historical geology course enjoyed the selection, and as one student explained: "It would be safe to say that this was the most interesting geology article I've read, because it was very descriptive and the story flowed so well." Students seemed especially responsive to seeing geologists use their knowledge for practical purposes, and they realized the importance of improving their communication skills. This paper presents an active-leraning approach applied to an upper level elective course titled Human Socities and Environment, which draws its subject matter from a variety of disciplines in the social and natural sciences. The paper recognizes that the desire to discuss current environmental issures is a significant learning motive, and experiments with a coursework design centered on a set of regularly convened student depate sessions. A student moderator conducts the debates between two teams of students. Lectures, Internet searches, numerical analysis, and research projects form supporting activities that serve to organize and inform the debates as well as to consolidate pedagogic value of the course. Faculty desiring to implement pedagogical change face disincentives related to finding appropriate teaching models and concerns about content coverage as well as those related to institutional and departmental support. Strategies for getting started on changing teaching methods include identifying individuals and programs that promote pedagogical change to develop a support network, making changes incremental, focusing on student learning, utilizing assessment techniques that address student learning styles and comprehension, starting with non-major courses, and making pedagogy part of ones research program. At the level of individual course development, incremental change allows incorporation of exercises that use relatively small amounts of lecture time (focused discussions and problem sessions). The use of cooperative learning strategies and reading notes expand on these activities. As instructors develop and gain experience with new teaching approaches, they can incorporate long-term projects and development of group analyses (which require investment of more classroom time). The important concern about content coverage can be addressed in two ways. First, directing student study time toward major concepts encourages them to teach themselves some of the material so that classroom time is largely used to explore more difficult material and applications. Second, instructors need to assess what information and concepts are really important and focus the course on those topics. Twenty practicing clay scientists (13 male, 7 female) were interviewed with a standardized, open-ended technique in a qualitative study to determine why and how they entered the clay science field. Solving a puzzle, figuring out how things work, discovering new knowledge, insights of life's origins, aesthetic appreciation, opportunities for personal/ professional growth, wonderment at the complexity of tiny clay particles, integration of many fields of study, and the numerous practical applications of clays inspired these scientists. Significant childhood events reported as sparking an interest in science were encouragement by family, having a rock/mineral collection, math/science employment of family members, experimenting with a chemistry set, exploring nature, and a strong interest in archaeology/ anthropology. Major factors that influenced choosing a career in science were enrollment in a college geology course, taking high school or college chemistry, and having an exciting elementary or secondary science teacher. The decision to specialize in clay science most often occurred during employment or graduate school. Graduate assistantships, work-related projects, contact with practicing clay scientists, and seeing practical applications of clay science influenced these decisions. Four clay scientists reported that earlier identification of this career interest would have helped them be better academically prepared to be clay scientists. Indicating the location a single mineral grain on a thin-section for students to use is not an easy task, but this system of using very thin strips of tape has proven to be quite effective. By isolating a single grain on a thin-section with three or four very thin (approximately 1mm or less in width) strips of tape allows all students to view and work with the same mineral grain. This technique can be used on grains as small as 0.4-0.2 mm, or even smaller if your hand is steady enough.